The independent research firm TechValidate has been surveying PrinterLogic customers with a view to capturing a range of experiences and opinions after installing our print management solution. A number of companies in the large enterprise and Fortune 500 categories have weighed in to share their results, which, if we’re honest, have been nothing short of remarkable. But what about companies in the small business category? How do they fare when migrating to PrinterLogic? TechValidate recently conducted a case study (TVID: B89-77F-081 ) on a small-business banking company to see what impact our print management solution had on its print environment. 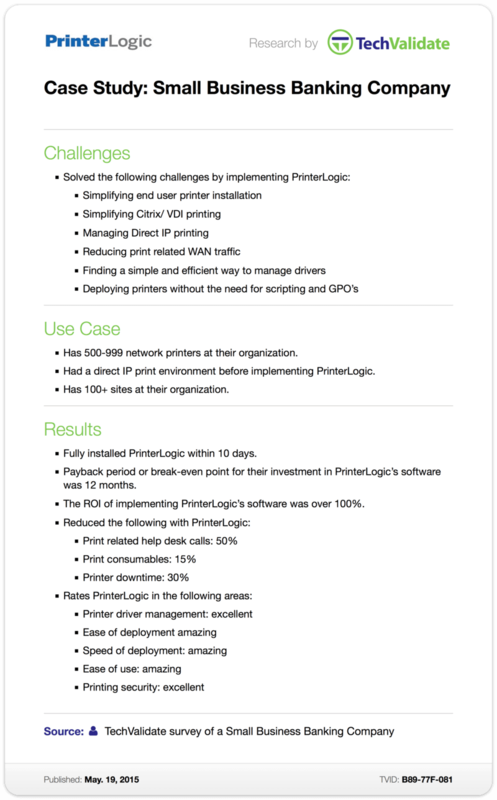 This company had a direct IP print environment prior to installing PrinterLogic, which meant that there were no print servers (and their related issues) to eliminate, but it did have more than 500 networked printers distributed across over 100 sites. That scale is on a par with some of our large-enterprise customers. The number of print-related service desk calls dropped by half. Printer downtime was slashed by 30%. Usage of print consumables (e.g., toner, paper) across the organization was cut by 15%. Those equated to significant dollar amounts. The company recouped its initial outlay on PrinterLogic within one year. Since that time the return on investment (ROI) of migrating to PrinterLogic has exceeded 100%. And it rated PrinterLogic as “excellent” in printer driver management and printing security. So, clearly, whether you’re talking large enterprise or small business, PrinterLogic brings both measurable and subjective benefits to any print environment. Why not see what it can bring to yours?